The All-In Translations team, winners of the Pentasia League and cup. 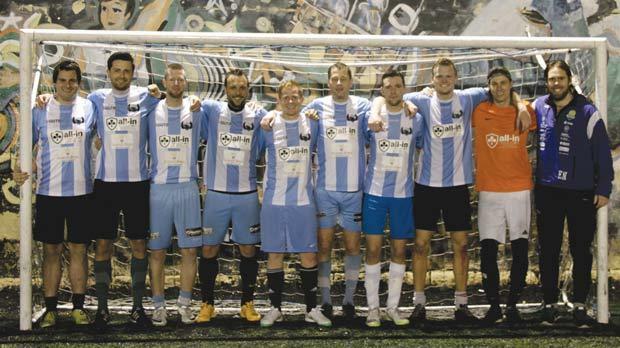 The Pentasia Clubs League was concluded last week when All-In Translations completed the double with a 7-2 win over Enetsport in the cup final. The Malta-based language service provider team had already won the championship with nine points. Casumo took third place, while FXGM won Division B. With 34 teams and 525 players divided in two divisions, few other sports activities in Malta engage more people. Most of the sides hail from gaming companies, but any team can register for this five-a-side league. Matches were played at the Antonio Bosio Secondary School in Gżira. “We have come close many times before, so it was a great moment for us to lift both the league and the cup trophies this year,” All-In Translations captain Roy Pedersen said. The champions fielded the following players: Pedersen, Eirik Thorvaldssen, Felix Preussner, Bjornar Heggernes, Christofer Holmgren, Jacob Nielsen, Chris Kiefert, Allan Horne, Anders Lynderup and Endre Nesset. The ninth edition of the championship is pencilled to start in October.